Director Jordan Peele’s 2017 debut feature Get Out instantly positioned itself as a watermark for horror. Its cunning inversions of well-trodden tropes delivered a powerful satire of race relations and a chilling indictment of latent and blatant racism in supposedly liberal white America. A huge box-office success, it rode a wave of adulation all the way to the Oscars almost a year after its release, whilst its imagery and metaphors have entered the zeitgeist. Such colossal achievement, one might have feared, could only presage a subsequent fall. How could Peele possibly hope to live up to the stature of his initial triumph? One needn’t have worried. In Us, Peele delivers a multi-layered, philosophical exploration of the existential fears frothing beneath the surface of contemporary America. Like its predecessor, the film holds a mirror up to the present so that the most terrifying spectre, as the title suggests, is our own reflection. But this is a very different film to Get Out. 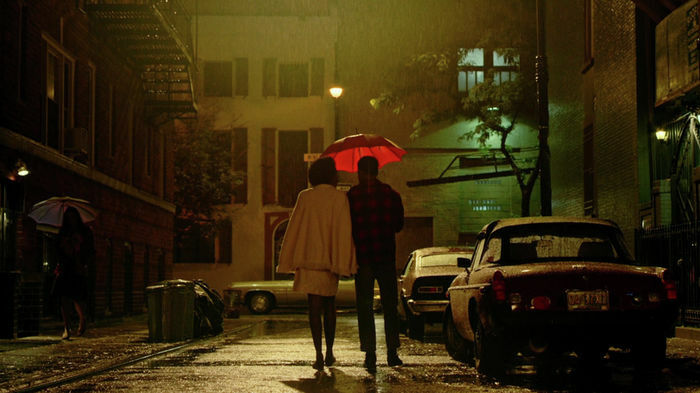 Peele has made clear that his latest project is not intended as an allegory on race, although there are brief moments which act poignantly to this effect. Instead, Us is an even more ambitious attempt to reflect upon wider divisions within society, from fear of the other to class tensions, and to the detrimental effects upon our interactions wrought by modern technology and consumerism. The film opens with a few lines of text which tell us of the existence of tunnels extending for thousands of miles beneath the continental United States, often abandoned, their purpose unknown. The underground railroads used by slaves in escaping to freedom here spring to mind, or perhaps the mines often situated on native lands where many of America’s indigenous people were compelled to labour and which devastated the ecological balance on which their former way of life depended. In Peele’s universe, the subterranean is home to the Tethered who await their moment when they will rise to the surface and wreak terror, a metaphor for the divisions, anxieties, and evils on which contemporary society rests. This theme is most effectively played out by way of a temporal tether between the film’s beginning and the present in the form of the Hands Across America fundraiser. This real-life benefit campaign aimed to raise funds and awareness for the homeless by encouraging Americans to form a human chain across the nation during the mid-eighties. But this well-meaning endeavour is inverted by the Tethered who, inspired by Adelaide’s childhood memories of the campaign, attempt to form their own chain. A symbol of unity thus comes to represent the ultimate triumph of division. Lupita Nyong’o’s turn as both Adelaide and Red should rightly draw considerable praise for the way she seamlessly flits between maternal tenderness and maniacal malevolence. But the intensity of the role is such that it does not allow much for comic relief. This duty instead falls largely to Gabe and Zora, whose penchant for dad jokes and casually pertinent asides respectively, are crucial to the early stages of the film, helping to build the audience’s rapport with the protagonists so that we truly care for their survival. But Peele is here determined to avoid the genre confusion that befell his debut. In Us, humour is never allowed to detract from horror but rather strengthens the film’s potency. The Wilsons cheerfully dispute each other’s “kill count”, finding sadistic comfort from their ordeal that momentarily blurs the distinction between them and the Tethered who have set them on their bloody course. Granted, the level of ambition makes this a more trying watch than Get Out. Whereas that film drew much of its strength from the clarity of its message and narrative, Peele’s intention here is to allow for a greater breadth of interpretation. There are a number of deliberately cryptic images and loose ends, most intriguingly surrounding the youngest of the Wilsons, Jason and his doppelgänger. Not everything adds up in Us, but this is a distinction, not a detriment. Audiences should walk away uncertain, perturbed, and with plenty to talk about.